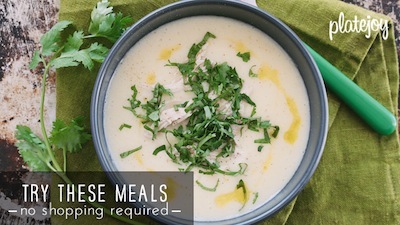 Here’s the quick and tasty: when losing the salt over the holidays, it doesn’t mean you’re burdened with bland meals. Instead, it means you have the opportunity (and duty!) to really stretch the classics and bring your favorite dishes to life with surprising flavors, exciting pairings, colorful twists. 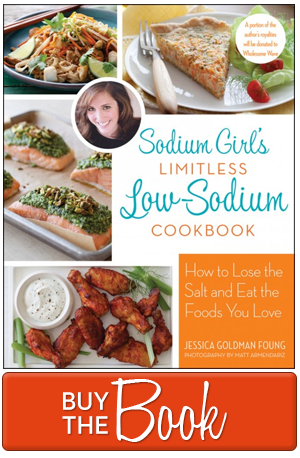 So over the next week, I’m going to do my best to stuff you full of low-sodium Thanksgiving tips. Keep an eye on Pinterest, Twitter, and Facebook for my favorite bites from the past and my new tricks for this year. And check back here often for recipes that will keep your holiday table merry and bright. And low-sodium. To kick things off, let’s start with sides. Of course I am a HUGE fan of potatoes. Mashed, scalloped, fried — they’re the best. And there are many ways to make them creamy without the high-sodium standard of parmesan and other cheese. But let’s say you’re ready for something different this year (or your aunt already called dibs on making the mashed potatoes). 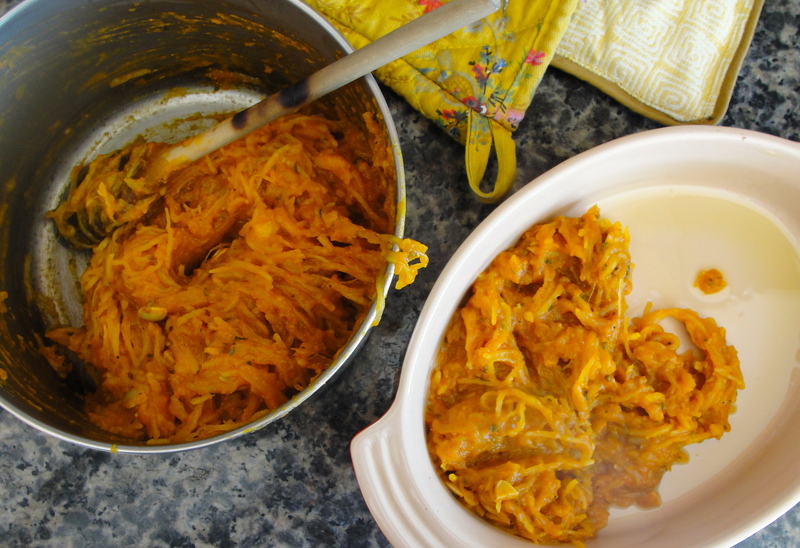 In that case, get your hands on two kinds of winter squash: spaghetti and pumpkin. Mix them together. 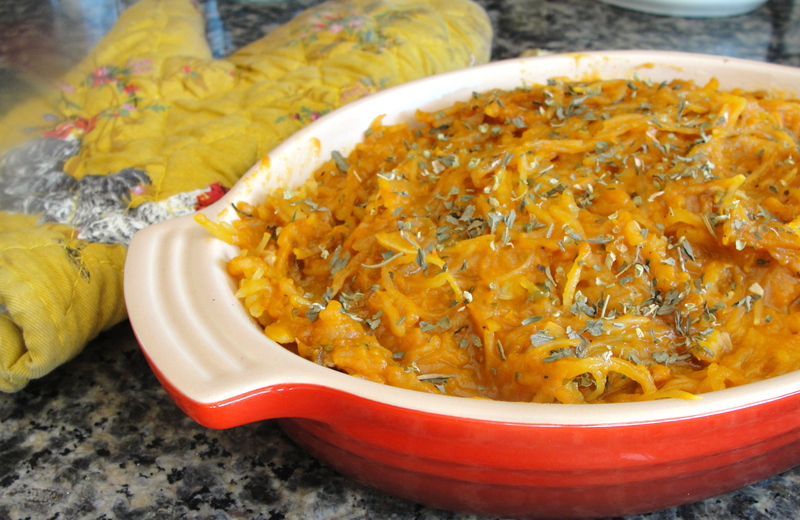 And create a gorgeous, creamy, noodley, and supremely healthy casserole for the buffet. Ain’t she pretty? She sure is. And tasty too. So if you’re ready to make a Thanksgiving side that will demand second helpings, then give this recipe a whirl. The good news is you can get started on this recipe a day ahead of Thanksgiving by roasting your spaghetti squash. Preheat the oven to 375 dgF and then place the WHOLE squash onto a pan and into the oven. Let it cook until it is soft enough to slide in half with a knife (no chainsaw needed), about 45 minutes to an hour. Wait for it to cool, at least 10 to 15 minutes. 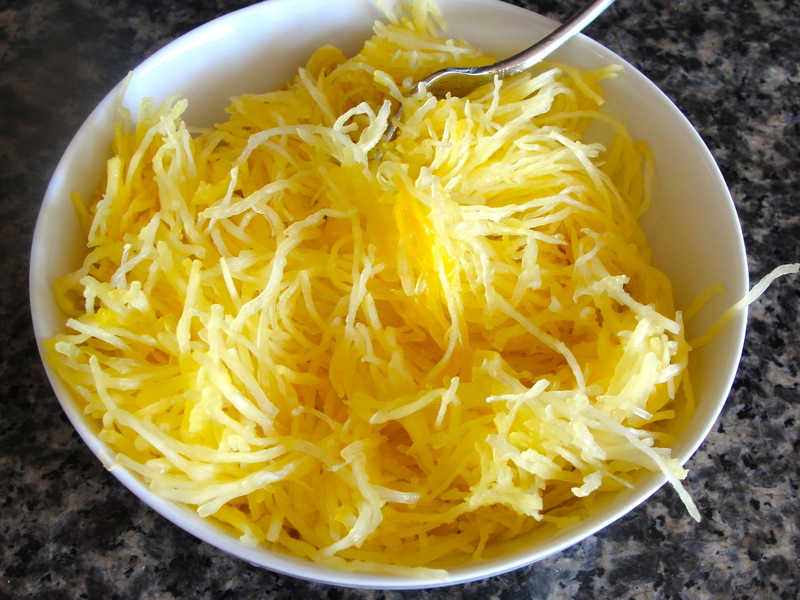 And then, using just one half of the spaghetti squash, use a fork to rake out all the spaghetti strings from the skin until you have piles and piles of vegetable noodles (see picture above). Save the other half for a post-Thanksgiving frittata or double the entire recipe for a bigger serving size. Now, as for the sauce, you can make this ahead of time too. 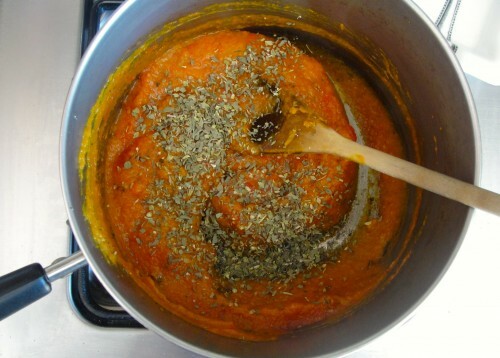 Simply dump your can of pureed pumpkin into a large pot and warm it up over a medium flame. Add the tomato puree and spices (oregano to cinnamon), and stir until everything is mixed. Cook for 10 minutes, stirring the whole time. And finally, add the spaghetti noodles to the pot. Give it a few more good stirs until everything is combined and then pour it all into a greased casserole dish. If it isn’t Thanksgiving yet, simply let the casserole dish cool, cover it with foil, and place in the fridge until the next day. Or, if it’s the big day, go ahead sprinkle the paprika on the top of the casserole and place it into the oven (still at 375 dgF), cooking for 15 minutes. Right before it comes out, switch on the broiler for 2 minutes to get the top nice and crispy. Sprinkle fresh basil on top and serve warm. This looks like an amazing side, I love spaghetti squash so much. Where can I find salt-free garlic granules? Do regular supermarkets carry that? Most supermarkets have them…just make sure to read the label and only buy products that say they are salt-free or have 0mg of sodium. Specialty spice stores like Penzey’s will also have them.